Figure 4.19: A final PostScript file consists of a stack of individual pieces. The -K and -O options control the generation of PostScript code for multiple overlay plots. All PostScript files must have a header (for initializations), a body (drawing the figure), and a trailer (printing it out) (see Figure 4.19). Thus, when overlaying several GMT plots we must make sure that the first plot call ommits the trailer, that all intermediate calls omit both header and trailer, and that the final overlay omits the header. 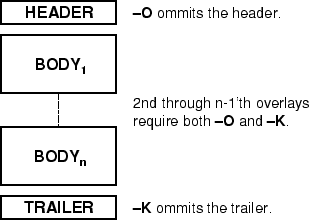 -K omits the trailer which implies that more PostScript code will be appended later [Default terminates the plot system]. -O selects Overlay plot mode and ommits the header information [Default initializes a new plot system]. Most unexpected results for multiple overlay plots can be traced to the incorrect use of these options. If you run only one plot program, ignore both the -O and -K options; they are only used when stacking plots.